Former Governor Mitt Romney’s once dead campaign is seeing some new life in the Wolverine State. A McClatchy/MSNBC poll conducted late last week puts Romney at an 8 point lead over Sen. John McCain, 30% to 22%. Huckabee pulls in 17%, Fred Thompson 7% and Rudy Giuliani and Ron Paul pull 6% and 5% respectively. Adding to Romney’s confidence going into Tuesday’s primary are two other polls – one with him leading and the other with him neck-in-neck with McCain. A Detroit Free Press/Local 4 poll has Romney up 27% to McCain’s 22% and the Detroit News/WXYZ Action News poll has Romney well within the margin of error – McCain 27% and Romney 26%. This is good news for a man who has his back against the wall. Iowa and New Hampshire have changed the tone of the GOP primaries to favor McCain, but Romney’s advantage in Michigan is that his roots are strong and his surname has been familiar for at least two generations. 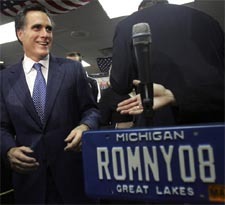 Romney should also be credited with some foresight. The Politico’s Mike Allen reports that, “[Romney] has cut back his advertising in South Carolina and has staked his candidacy on Michigan, his native state”, and these polls have finally shown this strategy has paid the dividends Romney has been betting on. Mr. Romney now needs to make sure that this lead holds. These Michigan polls should serve as a reminder that he was leading in New Hampshire – a state that shares much the same media market as Massachusetts and is arguably a state where the former Governor has roots as well (including his multi-million dollar summer home). Similar to New Hampshire, Michigan might look good for Romney on paper and all signs in the political world are pointing to a strong showing for him in a state that is a ‘must-win’ for his ailing camp. With no money in South Carolina and Mike Huckabee lobbing some excellent verbal bombs in his direction, he’s a wounded man in desperate need of a life-giving victory. My only caveat in this exciting race for the ages is the danger of putting too much weight on polling (see Hillary Clinton, New Hampshire 2008). Romney has every right to savor this moment and I’m sure he’s smart enough not to rest on his laurels. After all, it’s not Michigan he’s really after. It’s living to see South Carolina that keeps him up at night.